You have your resumé and your diploma…Now what? The harsh reality as you leave school to enter the job market is that no one knows who you are…. What they don’t teach you in school. The most qualified, most experienced and most educated student always gets the job. 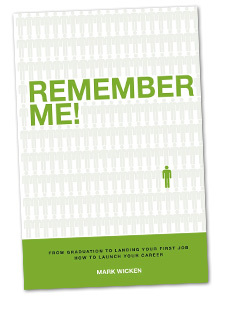 The first steps to getting a job is to be ‘remembered’ in your job search. Here is how. A job-search resource and guide for graduating students and first-time job seekers brought to you by executive recruiter and educator, Mark Wicken. REMEMBER ME! very well might be the best and ONLY book on job search you will ever have to buy.